Sandwich Panels are formed by adhesively bonding two relatively thin facings, or otherwise known as skins, to a low-density core material using a structural adhesive. The core provides important separation between the two skins, distancing them away from the centroid (the point about the average area distribution) of the panel. This displacement away from the centroid, concentrates most of the material as far away as possible from the centroid, and therefore increasing the second moment of area or otherwise known as moment of inertia. To prevent the skins slipping and working independently of one another, the two skins are structurally adhered to the core. As the panel is loaded and a bending force applied, one skin will to be in compression and the other in tension, it is the job of the core and structural adhesive to oppose this bending by providing a shearing force. 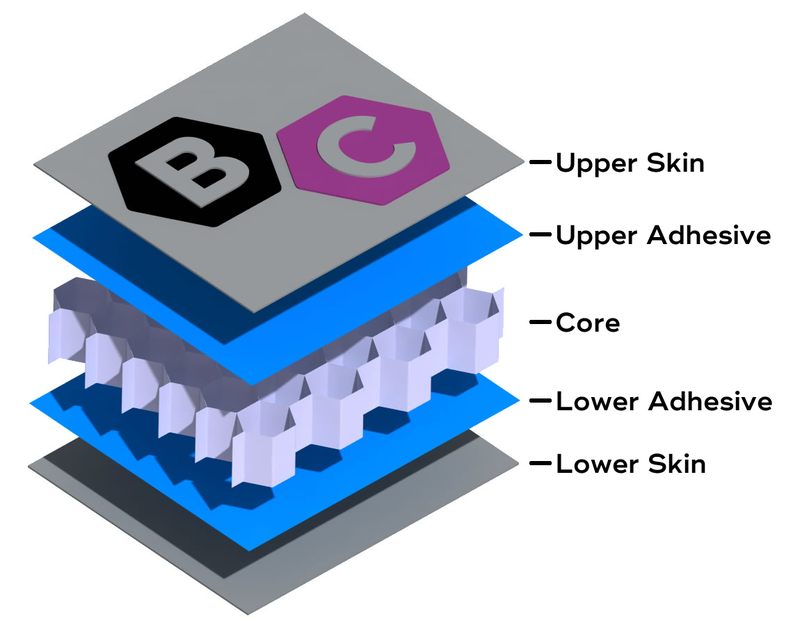 The core also supports and stabilises the panel skins, preventing the skins from localised buckling until the yield strength of the skin material is exceeded. It is therefore critical, the adhesive interface between the skin and core is of high quality and of high strength, allowing the shear loads to be transferred. This has been made possible with the development of high strength structural adhesives such as the Redux ® and Araldite ®. This unique make up, gives sandwich panels a very high relative stiffness, as well as a high bending strength to weight ratio, making them ideal for improving efficiency and performance in numerous sectors, such as aeronautical, automotive, locomotive and construction industries. This efficiency in stiffness and strength comes from separating the skins apart from each other which is done by the use of a core. Take for example just the skins without the core material separating them as thickness T, and that in this configuration it has a relative bending stiffness and strength of 1. If the skins were now to be separated so that the overall thickness is 2, noting the core material has an infinite shear capability, the relative bending stiffness would now be 7 times as much and 3.5 times the bending strength of the previous configuration with little added weight. Sandwich panel core can be categorised into two different types based on the structural geometry of the core’s cells. These being closed cell and open cell cores. The first category being a core with closed-cells, illustrated below, whereby small pockets of gas are encapsulated and trapped within the material with a complete membrane of the overall material surrounding the gas pockets, making the material impermeable. During the manufacturing phase of the material, the entrapment helps create the cell wall structure. A typical closed-cell core would be a cured polymer foam or End Grain Balsa, whereby there are lots of small bubbles suspended throughout the material, however it should be noted that not all foams have closed-cells. End Grain Balsa (EGB) is nature’s own low density closed-cell core material with an extremely low specific weight and a high specific stiffness. Specially grown in plantation rooms, End Grain Balsa wood provides a sustainable source core material with a high rigidity and stiffness when coupled and bonded into a sandwich panel. Owing to its closed-cell structure it has an excellent resistance to moisture making it ideal for a variety of applications including marine. Another largely used closed cell core material are cross-linked polymer structural foams which exhibit impressive mechanical performance for their weight. They also have other advantageous material properties such as, low water absorption and superb damage tolerance, making them excellent for marine applications or where water ingress could be a problem. Furthermore, sandwich panels with specialised and correctly specified foam cores for the panels application, can have excellent FST (Fire, Smoke and Toxicity) properties. An open-cell material illustrated below, is where the membrane of the cell is incomplete allowing the movement of gases or fluids through the lattice structure, making it a permeable structure in its raw state. A typical open-cell material would be an aluminium or Nomex ® honeycomb lattice. Nomex ® honeycomb is a lightweight non-metallic resin strengthened core manufactured from Aramid fibre paper by Dupoint. This special paper is bonded and manufactured similarly to Aluminium Honeycomb. Following expansion, to strengthen it, it is dip coated in its expanded state with a heat resistant phenolic resin. This gives Nomex ® an excellent cell wall stiffness, as well as providing reduced fire, smoke and toxicity (FST) for use in aerospace structures to CS25.852. Nomex ® core is extremely versatile with it being manufactured in various cell geometries, allowing it to be flexed and used in complex double curvature panels. It can be bonded to aluminium or fibre Reinforced Plastics skins using film adhesive. Aluminium Honeycomb core starts off by laminating and pressing together many aluminium sheets / foils with carefully applied structural adhesive. Once cured, it is commonly called a HOBE (HOneycomb Before Expansion). The HOBE is then carefully cut into a slice and expanded by pulling the ends to develop the correct cell size, and thus creating Aluminium Honeycomb. To learn more about how Aluminium Honeycomb is manufactured, please visit our dedicated page using the link below. Perforated cores can also be used to prevent over pressurisation to the structure caused by differential pressures. Material. Open-cell core materials come in a large variety of cell sizes and selecting the correct size or density will determine whether the panel is optimal with regards to weight, strength and material costs. Generally, the larger the cell size, the lower the cost and density. However, if combined with thin skins, it can result in intra-cell buckling (also known as telegraphing or dimpling) of the panel surface. This can be prevented by using a smaller cell size which would give an improved surface appearance and, at the same time provide a larger bonding area. The down side of this will be a higher material cost as well as increased weight. It is therefore important to optimise the cell size along with the skin thickness in order to prevent telegraphing but at the same time keep weight and cost down to a minimum. The bonding process involves the preparation of the materials (cleaning and acid pickling), application of liquid or film adhesive, layup in an autoclave or hydraulic press, and curing. The assembly is then cured under a controlled temperature and pressure. Depending on the adhesive used, core and skin material, and the type of curing facility used, will vary the curing conditions considerably. However, most structural adhesives cure at 120°C or 177°C. Reliable, high strength bonding is primarily dependent upon stringent material and process control, with all phases of the bonding process given careful attention. For instance, it is important that the surface preparation acid pickling solutions are kept within the limits specified in the process specification and are checked frequently. Additionally, the assembly of the components should be carried out in a controlled atmosphere, where dust and contaminates are kept to a minimum and temperature and humidity is controlled. Following cleaning, all material should be handled carefully with cotton gloves to prevent contamination from skin oils. It is also important the handling and storage requirements from the supplier for adhesives is followed and reduced storage temperatures are kept within the shelf life. To achieve the optimum adhesive properties, rigours control over the cure and pressure is needed to be maintained. Honeycomb has an impressive ability to absorb mechanical energy by plastic deformation without rebound making it perfect of use in high performance race motors, where safety of personnel in the event of an accidents is vital. Bonded Components has for many years manufactured screen printing bases, with black plastic laminate (Formica ®) or aluminium alloy surfaces. The skin of the vacuum bases can be drilled at varying intervals depending on customer specification. For further information on screen printing bases, please contact us using our contact page.